MLB veteran umpire Tim Welke (3) has retired following knee surgery. Welke had been listed on MLB's roster in January 2016, and again on the late February Spring Training list, but the crew chief was not assigned to a crew. News of the elder Welke's (brother Bill #52 remains on the staff and has already worked several games this spring) retirement comes months after he underwent knee replacement surgery in January; Welke is scheduled for a second surgery in June. Tim Welke retires 33 years after he first began in the American League after officiating a total of 4,216 regular season games, his 4,000th coming on April 13, 2014 in Cincinnati, three All-Star Games, eight Division Series (35 games), seven League Championship Series (41 games), and four World Series (22 games). His assignments took him across the United States and Canada, and to Sydney, Australia for the 2014 Dodgers-Diamondbacks Opening Series. His 72 career ejections began with Boston's Ralph Houk and Bob Stanley in August 1983 and wrapped up with New York's Joe Girardi in 2012. 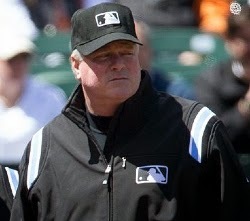 Link: UEFL Umpire Profile: Tim Welke.